New Rochelle, NY, May 10, 2018– Researchers at Allina Health (Minneapolis, MN) conducted a large NIH-funded observational study to examine pain treatment outcomes of integrative medicine in hospitalized patients. What they found was that when integrative interventions lowered pain there was an associated cost saving according to a recent article in JACM (The Journal of Alternative and Complementary Medicine). JACM is a peer-reviewed journal from Mary Ann Liebert, Inc., publishers dedicated to examining paradigm, practice, and policy advancing integrative health. The article is available free on JACM website. In "Cost Savings from Reducing Pain Through the Delivery of Integrative Medicine Program to Hospitalized Patients," lead investigator Jeffery Dusek, PhD (then with Integrative Health Research Center, Penny George Institute for Health and Healing, Allina Health and now with the Kripalu Center for Yoga and Health) and a team that included Michael Finch, PhD and David Watson, PhD (Children's Minnesota Research Institute) examined EPIC-based electronic health record for 2730 hospitalized patients during the study period. Through a methodology that associated reduction in pain with reduction in hospital costs, the researchers determined that pain reductions from integrative medicine interventions were associated with a cost savings approaching $1,000 per hospital admission for those receiving integrative medicine. "The results indicate that when integrative medicine interventions reduce patients' perception of pain in the acute care setting, there is a corresponding decrease in the total cost of the patients' care," states Jeffery Dusek, PhD, adding: "While the amount of savings are substantial, future studies are needed to optimize the delivery of the integrative medicine interventions in order to maximize the cost savings." "Credit NIH National Center for Complementary and Integrative Health for the investment in this critically important – yet still rare – exploration of cost outcomes from integrative practices," comments JACM Editor-in-Chief John Weeks, johnweeks-integrator.com, Seattle, WA. "The value proposition for these integrative practices – both in cost and patient care – may be even stronger if one considers the potential – not measured here – that the integrative medicine also reduced use of opioids, those limiting attendant societal costs of those agents." Research reported in this publication was supported, in part, by a grant from the National Center for Complementary and Alternative Medicine (NCCAM) now the National Center for Complementary and Integrative Health (NCCIH) of the National Institutes of Health to JAD (AT006518). 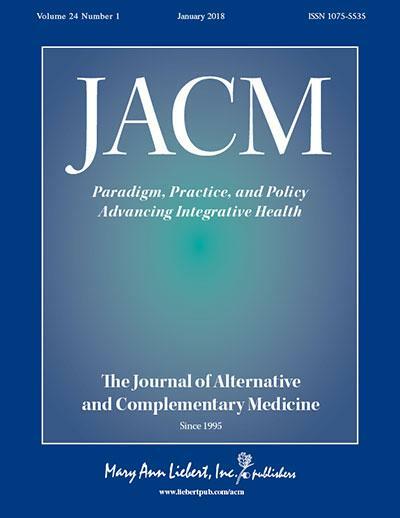 JACM (The Journal of Alternative and Complementary Medicine) is a monthly peer-reviewed journal published online with open access options and in print that is dedicated to research on paradigm, practice, and policy advancing integrative health. Led by John Weeks (johnweeks-integrator.com), the co-founder and past Executive Director of the Academic Collaborative for Integrative Health, JACM publishes human clinical trials, observational studies, systematic reviews and commentary intended to help healthcare professionals, delivery organization leaders, policy-makers and scientists evaluate and integrate therapies into patient care protocols, payment strategies and appropriate protocols. Complete tables of content and a sample issue may be viewed on the JACM website.